Noting that “far too often, girls are not given the space and opportunities they need to achieve their full potential,” he said that today, 600 million adolescent girls are preparing to enter a workforce, “transformed by innovation and automation”, in which female college graduates and workers are outnumbered. Women make up less than 30 percent of graduates in information and technology and occupy less than 30 percent of research and development jobs globally. He underscored the importance of equipping youth with skills transferable for lifelong success, noting that abilities such as critical thinking, creativity, and digital awareness will shine through in a changing workforce. 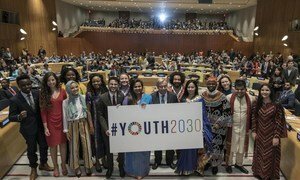 Highlighting the value of a support system, he said that having role models in fields where the presence of women is sparse, is key, and referenced the recent launch of Youth2030 in September 2018, a strategy aimed at understanding youth needs, and supporting them in materializing their ideas. The Executive Director of the UN Population Fund (UNFPA) Natalia Kanem, said to mark the day, that too many girls face roadblocks on their journey to adulthood. 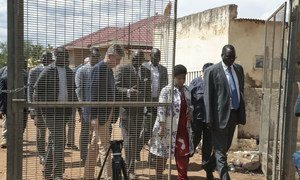 The Executive Director of UN Women, Phumzile Mlambo-Ngcuka, added that during this critical time for girls, men and women alike must “listen hard and speak louder,” when it comes to protection girls and championing their rights. She underscored the importance of solidarity in resisting and countering silence in the face of sexual abuse, recounting the marches of protest and online movements such as #MeeToo, which that have thrown the spotlight on inequality in recent months. “We celebrate the strength and the potential of the 1.1 billion girls in today’s world who are challenging the status quo, raising their voices against violence, innovating technology to solve global challenges, standing up for the environment, and preparing to lead”, said the head of the UN’s gender-equality agency. You can check out UN Women's special page to mark the day, here. “A collective consciousness is rising to ensure that the right to quality education for all girls becomes a reality”, she added.